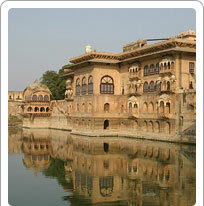 The Bharatpur Palace is a magnificent building made in the Rajput and Mughal architectural styles. The apartments in the Palace have beautiful carvings and furnishings and the floor tiles have interesting patterns. The palace is located very close to the museum and can be easily visited by tourists to the city. Bharatpur is a mere 55 km from Agra and just about an hour in travel time.